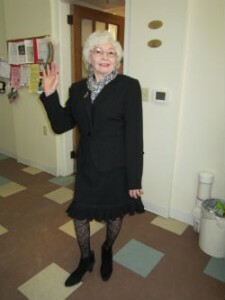 On March 27 the Staunton Senior Center was the scene of the “Bloom into a New You” Fashion Show. Approximately fifty members, staff, volunteers, and visitors screamed and applauded for 15 SSC and Waynesboro Senior Center members who were modeling their favorite colors and styles through dresses and suits adorned with accessories provided by Anna Stell of Interim Home Health, Shelly Lam with Kings Daughters Community Health & Rehab Center, Alyssa Clark of Envoy of Staunton, Jessica Miller of Care Advantage, Amy Boyers of Emeritus at Staunton and Tara Green of Legacy Hospice. These phenomenal ladies, who provide health programs at SSC, made possible the Fashion Show with their generous donations of hats, scarves, hair extensions, ties, make-up, and jewelry, not to mention the special punch and fruit refreshments and loving care as they assisted each participant in putting his or her best foot forward! Individuals stopped for a photo and then proceeded down the runway to ‘70s music prepared by Anna. Alyssa was MC, describing each model’s favorite colors, hobbies, accomplishments, and future plans. All in all, it was a wonderfully fun and highly recommended experience for all involved, and the goal of encouraging positive mental health among members through noting dress and color was definitely achieved!